The Oakland Business Review is the award-winning, bi-monthly publication of the Oakland Metropolitan Chamber of Commerce. 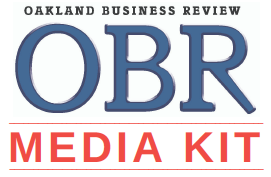 With a readership of more than 15,000 business people in and around Oakland, OBR is the leading business publication focusing on Oakland and the greater East Bay region. Our business news keeps you up to date, and features touch on many of the member businesses of the Chamber, with special sections profiling successes of organizations both small and large, bringing you the inspirational stories of the people behind them. Chamber members, submit your editorial content (bylined articles, press releases, etc.) using link below for consideration in the Oakland Business Review and on the Chamber's multiple social media platforms. We review all submissions and, depending upon content, may schedule content submitted for later issues. We are currently accepting material for the January/February 2019 edition of the Oakland Business Review through the end of day March 1st, 2019. Recent new Chamber Members, your membership includes a complimentary profile in a future issue of the Oakland Business Review. Upload your max 250 word organization description content, and a high res logo here. New Member Profiles must be received no later than end of day March 1st, 2019. The 2018 Media Kit is available. Please email Julia Lehman for information and/or space reservations. Next issue JULY/AUG 2018. Deadline for space reservation: AUGUST 25, 2018. Deadline for ad art submission: SEPTEMBER 1, 2018. CLICK OBR MEDIA KIT PIC BELOW TO REVIEW AND DOWNLOAD. Contact us for 2018 rate information and placement guide. Please email Julia Lehman for information and space reservations. 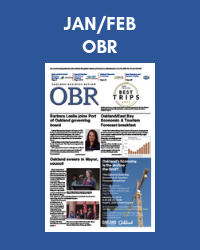 The Jan/Feb 2019 issue of the Oakland Business Review is out! Check your mail or read online by clicking the photo below. Thank you to all our advertisers and contributors! #OAKPROUD! For earlier issues, please visit the OBR Archives.